I can’t begin to imagine the amount of written content Charles Haddon Spurgeon would have produced in our day. 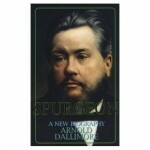 For example, in his biography of Spurgeon, Arnold Dallimore records that Spurgeon penned up to 500 personal letters per week. You read correctly, 500 per week. Simply stated, that is nothing short of incredible, especially when reminded that he did it with pen that he dipped in ink. But beyond being amazed at Spurgeon’s discipline and productivity, there is a practical example to be emulated for the sake of the gospel and the good of others. Very few of us will ever be the kind of prolific writer that Spurgeon was, but everyone of us can plead for the salvation of others with the thoughtful stroke of pen or keyboard. Have you ever written to someone on the behalf of Christ and begged them to be reconciled to God? (2 Corinthians 5:20) I hope and pray that the following letter from Spurgeon will inspire you to do that very thing. It has on more than one occasion inspired me. I was a little while ago at a meeting for prayer where a large number of ministers were gathered together. The subject of prayer was “our children.” It soon brought tears to my eyes to hear those good fathers pleading with God for their sons and daughters. As they went on entreating the Lord to save their families my heart seemed ready to burst with strong desire that it might even so. Then I thought, I will write to those sons and daughters, to remind of their parents’ prayers. Dear Arthur, you are highly privileged in having parents who pray for you. Your name is known in the courts of heaven. Your case has been laid before the throne of God. Do you not pray for yourself? If you do not do so, why not? If other people value your soul, can it be right for you to neglect it? See, the entreaties and wrestlings of your father will not save you if you never seek the Lord yourself. You know this. You do not intend to cause grief to dear mother and father: but you do. So long as you are not saved, they can never rest. However, obedient and sweet and kind you may be, they will never feel happy about you until you believe in the Lord Jesus Christ, and so find everlasting salvation. Think of this. Remember how much you have already sinned, and none can wash you but Jesus. When you grow up you may become very sinful, and no one can change your nature and make you holy but but the Lord Jesus, through His Spirit. You need what father and mother seek for you and you need it NOW. Why not seek it at once? I heard a father pray, “Lord, save our children, and save them young.” It is never too soon to be safe; never too soon to be happy; never too soon to be holy. Jesus loves to receive the very young ones. You cannot save yourself, but the great Lord Jesus can save you. Ask him to do it. “He that asketh receiveth.” Then trust in Jesus to save you. he can do it, for he died and rose again that whosoever believeth in him might not perish, but have everlasting life. Come and tell Jesus you have sinned; seek forgiveness; trust in Him for it, and be sure that you are saved. Then imitate our Lord. Be at home what Jesus was at Nazareth. Yours will be a happy home, and your dear father and mother will feel that the dearest wish of their hearts has been granted them. I pray you think of heaven and hell, for in one of those places you will live forever. Meet me in heaven. Meet me at once at the mercy-seat. Run upstairs and pray to the great Father, through Jesus Christ.